I was in Italy on business this week and as I was flying in and out of Venice airport had the chance to spend a half-day in Venice. It was foggy and damp, but still enjoyable to walk around for a while. 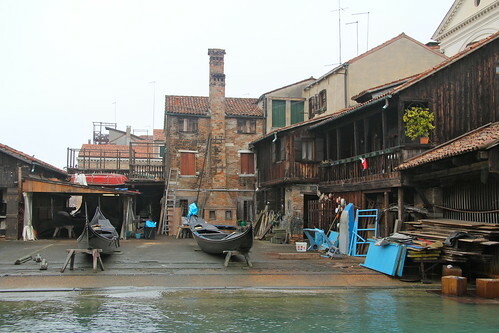 While I was there I stumbled on the gondola maintenance yard. It had to be there in Venice somewhere, but I’d never seen it before. It was clearly a place that had been there for a very long time – since the 17th century, apparently. So much that’s good comes from taking Academia bridge to San Marco, rather than Rialto bridge. I love Campo Sta. Margarita, for example, and going that way took me past Loris Marazzi’s workshop too a few years ago, where I bought the bow tie I now wear to formal events.